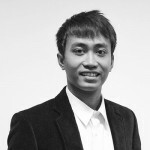 Mohan graduated from Sebelas Maret University, majoring in Information Technology. Mohan's speciality in desktop aplication, but he has a high spirit in learning and improve himself with other skill, Mohan successfully supports by involved in some project such as a new breakthrough technology for 4D Augmented Reality Experience with Dancow Learn&Explorer, Morinaga Interactive Digital Games, Santa Claus Dancing eyes, etc. Mohan likes to play football and Badminton in his leisure time.